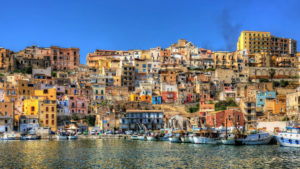 Fishing, carnivals and spas may seem like a strange mix of characteristics, but these are the things that really sum up the town of Sciacca (pronounced Shaka) on the south coast of Sicily, a little up the coast from Agrigento. From its port the town climbs up cliffs until it reaches a kind of plateau from which the views out to sea are stunning. Dominating the views inland is Monte Cronio, home to steaming, gurgling tufa caves that for so long have drawn visitors. Nearby up and down the coast are a series of wonderful, (relatively) uncrowded beaches. Only a relatively narrow stretch of sea divides Sciacca from North Africa and in many respects the town owes a great deal to the Arabs who sailed across the Mediterranean in 840. While the town had existed in different forms since Greek times – the inhabitants of nearby Selinunte journeyed to the area to take the abundant sulphurous waters and the Romans gave the town a name, “Thermae Selinuntinas” – it was the Arabs who really decided to take advantage of the town’s strategic position and to develop its not inconsiderable resources. The port was turned into a thriving commercial centre for trade between Sicily and North Africa and a town plan was drawn up and put into place. Agriculture flourished like never before and the fishing industry, now such a fundamental part of the town’s life, grew in importance. The Normans took over, enlarged the town with churches and palazzi and life continued relatively peacefully until the infamous “Sciacca Case” – a bloody feud between the two most powerful families of the town, the Perellos and the Lunas. The cause of this bloodbath was a jilted bride. No-one seems to know the exact circumstances anymore (if they ever did!) but suffice it to say that beautiful and rich Margherita Peralta, a member of the Spanish Lunas family, never did get to marry the handsome Giovanni Perollo! So enormous was the insult that all hell was let loose and an epic eye-for-an-eye, tooth-for-a-tooth struggle broke out that is said to have lasted over 100 years and killed over half the town’s population. Today, Sciacca’s main industry is still fishing and the fleet in Sciacca is amongst the largest in Italy. Heading down to the port early in the morning is a real spectacle and the restaurants in Sciacca will be serving up the day’s catch just a few hours later.